Philip Geddes was European Editor for Financial Times Television for ten years in the 1990s. He then worked as an adviser to the Commission and other European bodies for 15 years. For more years than I can remember, the EU has been worried that there is no European media giant to champion European views as US media giants do. It is not for want of trying. 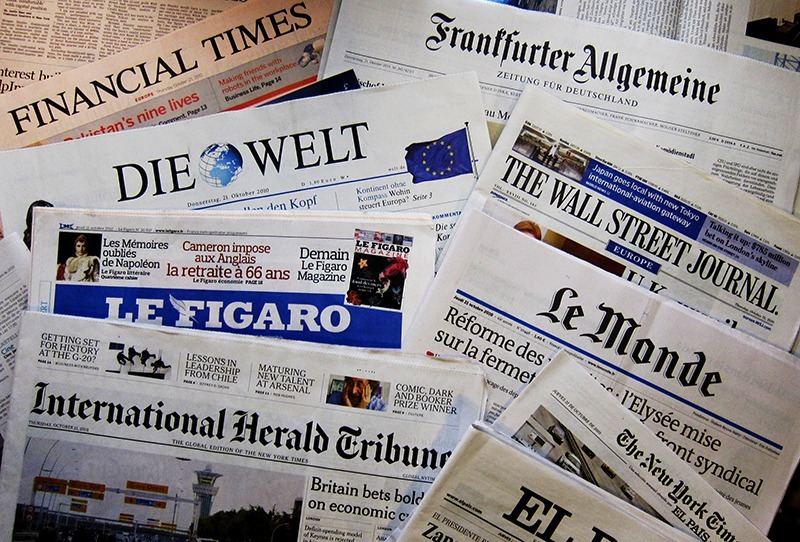 German, French and British media groups have all aspired to lead the European media market. But a combination of language problems, old fashioned editorial thinking, regulatory barriers and politics have conspired to keep Europe’s media fragmented. Even those chasing leadership of market segments have found the going hard. The Financial Times – for which I worked for ten years – spent a lot of time and money trying to get a serious position in our chosen market. We managed to reach many of the business and policy opinion formers, but few of the wider European population. And even that has proved transitory as information suppliers like Bloomberg and Reuters carved out a share of this market. No one has successfully created a pan European media proposition widely acceptable to the market, with the possible exception of the BBC, trading on the steady expansion of English as the common language of Europe. It is noticeable that the current Greek crisis has been conducted, at the pan-European level, almost entirely in English, which gives an advantage to the BBC. The problem is not that Europe does not create news. Europe is currently creating rather more news than its citizens can comfortably handle. Coverage of European issues focuses on the crises – and one must remember that crises sell papers. I cannot tell you how many times I have had to explain to senior Eurocrats that you have to have a news story if you want to interest the media. “European Fisheries Plan will transform Europe” is not a headline that sells papers. Much more important is the failure – certainly on the part of European officials – to understand the dynamics of journalism. Journalists are like sharks. Proceed boldly and firmly through the sea and you will be treated with an element of grudging respect. Navigate like Costa Concordia – recklessly onto the rocks – and you will be subject to a feeding frenzy from the media. And sadly, for most journalistic observers of Europe, the EU is a lumbering, out of control cruise liner steering ever closer to the rocks. 2.5% growth would be regarded as a miracle in most of the EU today! The Paper went on to suggest a number of ways in which Europe could “adapt behaviour to the rapid changes taking place in today’s world” and it all made good sense. But it didn’t happen. Whatever measure you take – and I write as a business journalist – Europe’s global position (which looked so promising in the early 1990s) is fading fast. Economic growth is falling, share of world trade declining, product innovation declining, with most mainland universities dropping out of global ratings, etc. And there are huge structural problems – the massive increase in internal migration, faltering economic growth, lack of integration in the eurozone, failure to create a viable energy policy – which Europe simply hasn’t tackled. The US has already turned away from the EU, which it no longer sees as a key area of US interest, while Britain is at best lukewarm. The share of Britain’s exports which goes to EU states has fallen by over 10% in the last ten years as British business concentrates on other global opportunities. We live in a globalised world, and nothing Europe says can change that. In these circumstances, it is inevitable that editors will give Europe a low priority in news terms. It is interesting that Xinhua, the Chinese news agency, has the largest media representation in Brussels. I can only assume that the Chinese view Europe today just as European visitors viewed China in the 18th century – as an interesting oddity, a badly run shambles with a glorious past where a trader could still make a quick buck, but not a place of any underlying significance. I am afraid the truth is that Europe must get itself credible messages about its future and then maybe journalists – and media groups – will treat it seriously. Otherwise it is just blood in the water….